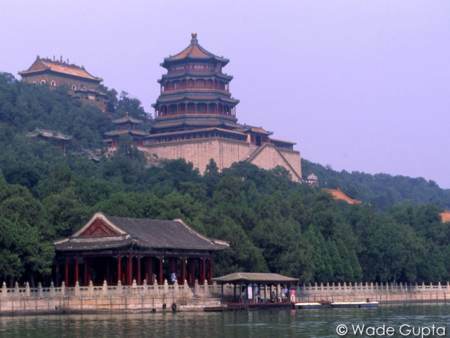 The Summer Palace (used to be called Yiheyhun or Yiheyuan means "garden of restful peace"), is located 15 km northwest from the the centre of Beijing and occupying an area of about 300 hectares. The palace is associated with the Qing dynasty's dowager empress Cixi, but has a history of more than 800 years as an imperial garden dating back to the 1150s. It largely destroyed in the war of 1860 and restored on its original foundations in 1886 . The natural landscape of hills and open water is combined with artificial features such as pavilions, halls, palaces, temples and bridges to form a harmonious ensemble of outstanding aesthetic value.